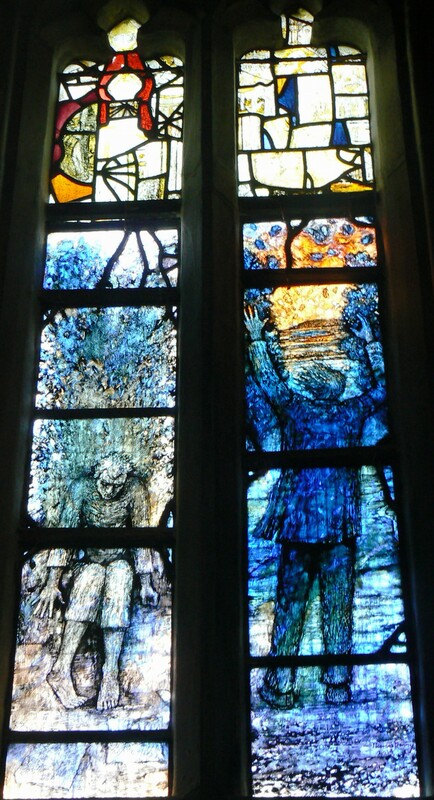 This entry was posted in Art, Cotswolds, Creativity, Depression, Gloucester Cathedral, Heritage and History, Photography, Remembrance, Stained Glass, Weekly Photo Challenge and tagged F W Harvey, Gloucester Cathedral, Ivor Gurney, Stained Glass Windows, Tom Denny. Bookmark the permalink. 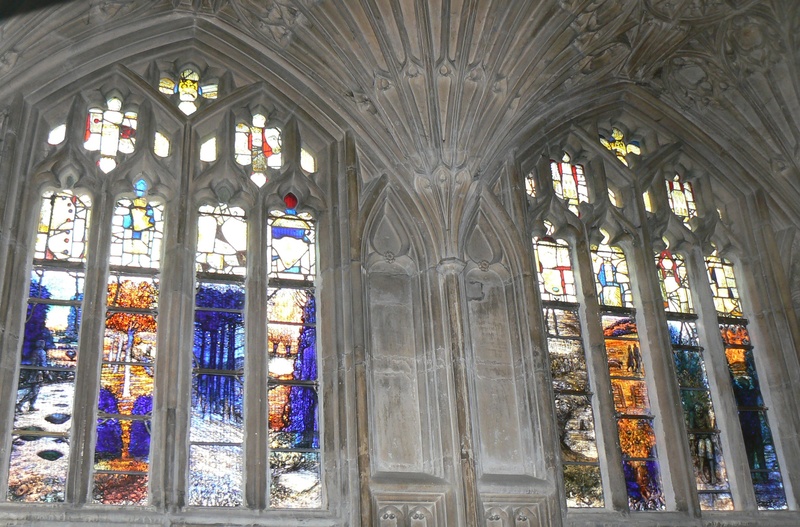 Came across the windows quite by chance a couple of weeks ago when we popped into Gloucester Cathedral on our way home from the Wye Valley. It would be so easy to miss them too, tucked away as they are off the Lady Chapel and with no obvious signage that we noticed. We are lovers of both Gurney’s and Finzi’s music so to find these wonderful images was a joy – they are astoundingly beautiful. And to then stumble today on the commentary here by Sarah Connolly has only added to the experience! 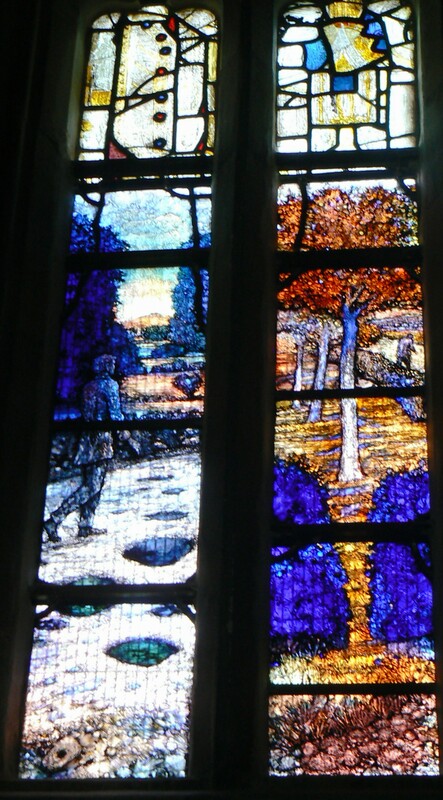 I’m going to be talking about Gurney this Remembrance Sunday; as others have said, it’s strange that we remember the WWI poets more than the musicians, but he of course was both. Thanks to all who had a hand in this project. I’m so glad you found the xquisite windows. Such moving tributes to sensitive souls. Thank you so much for reading my blog and posting a comment. I appreciate it. Where are you giving your talk? I love stain glass. Thank you for this post/writing and the beautiful pictures. Oh so much to learn and be moved by. Blessings to amazing you! Thanks for sharing. Im so honoured that you have been reading my blog. It is such a joy to share something as beautiful as these windows. I love seeing other people’s blogs for just that reason + we share what we see for the benefit of others who may not get to see these things in person. One day, whilst rifling through the English song draw marked G in the Royal College of Music library, I came across Ivor Gurney’s song, ‘Sleep’, and after playing and singing all the songs I had selected that session, his was the most startlingly beautiful. Everyone who discovers ‘Sleep’ for the first time is deeply moved by it, history supports that. I was determined to find out about Ivor Bertie Gurney, since I felt his song expressed such character and depth and pain. later that year, I wrote an exam thesis about him, quite modest, but from then on, his songs were always included in my recitals, however lowly those concerts were as a young musician. If only I had known that my harmony professor, Jeremy Dale Roberts had once been responsible for the fate of IBG’s entire musical oeuvre, after his friend and mentor Gerald Finzi had died. Finzi had successfully fought to rescue Gurney’s works from his jealous brother Ronald who had threatened to chuck the lot on the fire. Think of the discussions Jeremy and I could have had! 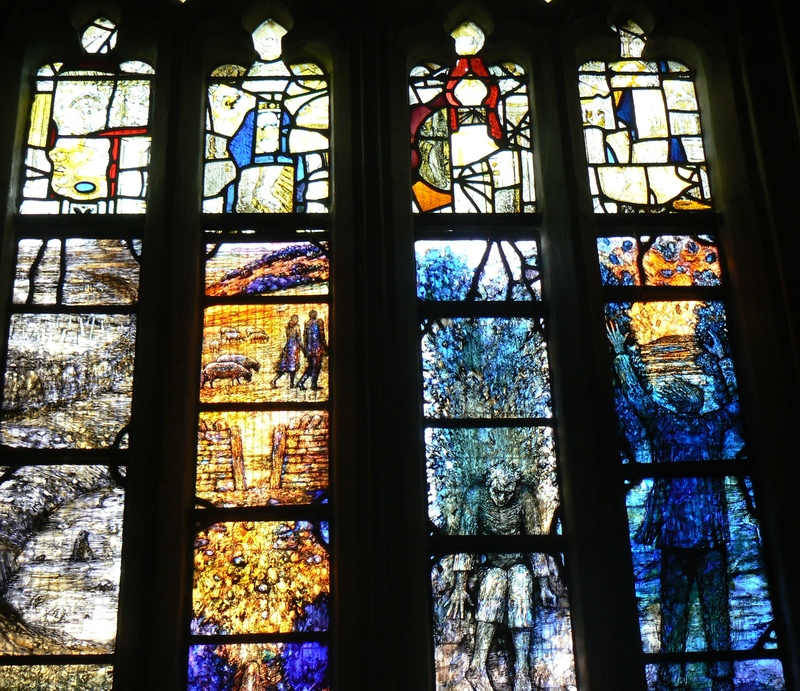 We have them now of course and I invited him and Joy and Kiffer Finzi to attend the fundraising concert, the unveiling and dedication ceremony of Tom Denny’s Gurney window in Gloucester two years ago. 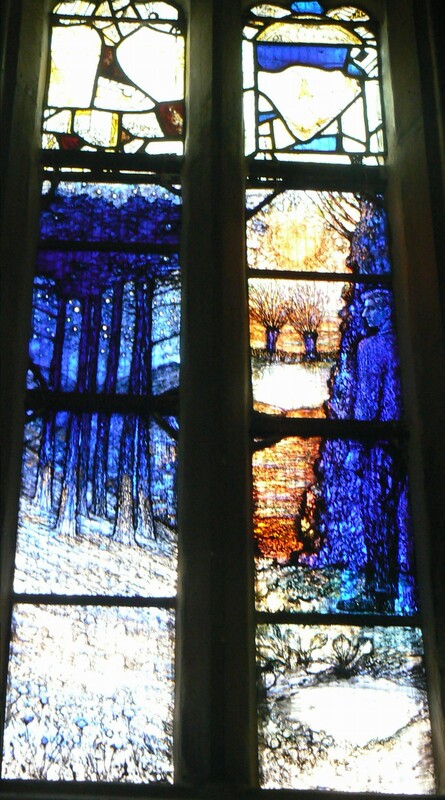 The idea for a Gurney window was mine, and if I am grateful for any influence my career has afforded, it is that I did not even need to persuade the wonderful Glos Cathedral staff and Tom Denny, since they were unreservedly enthusiastic about it. A few months later in a meeting with the wonderful Robin Lunn, who very sadly died recently, Tom Denny showed us his watercolour sketch of the 8 lights. I was moved to tears. I had requested that one light showed how Ivor suffered from what would be described today as Bi-Polar disease throughout his life. Shell-shock and the nightmare on the frontline would have heightened that condition to breaking point. I also suggested to Tom that the lights be influenced directly by IBG’s poetry, since he was respected enough to be included in Westminster Abbey’s Poets’ Corner and a published poet in his own lifetime. Tom selected several poems to cleverly infuse each subject and the whole tone. At my request, the Cathedral agreed to display the poems next to the window. To raise the funds to pay Tom and the Cathedral for hosting an all day/evening event, I needed to raise around 26k minimum. Selling 800 seats for the evening concert was proving difficult. Rupert Christiansen very kindly ran an article in the Daily Telegraph http://www.telegraph.co.uk/culture/10231723/Ivor-Gurney-tribute-to-an-outstandingly-talented-poet-and-composer.html some local museums helped along with a JustGiving campaign under the aegis of the Cathedral’s charitable status. The funds were raised from the day’s music making and from generous donations. Artists kind enough to give up time in their busy schedules included Simon Callow, Dame Felicity Lott, James Gilchrist, Neal Davies, Vernon Harwood, Joseph Middleton, the English Chamber Orchestra, Tenebrae Choir, Adrian Partington, Professor Jeremy Dibble, Nigel Short, and composer Judith Bingham who also wrote A Walk with Ivor Gurney for myself and Tenebrae to perform on the occasion and to many others who helped and advised me. At the dedication ceremony, where I sat next to composer Ian Venables, chairman of the Ivor Gurney Society, (of which I am now a proud patron), we both shed a few tears when the Dean Stephen Lake intoned the official words of welcome to Ivor Gurney who at last had a gorgeous tribute fitting to his status and life devoted to music and the Cathedral. Oh my goodness Sarah I am overwhelmed and honoured that you took time to read my blog and comment. 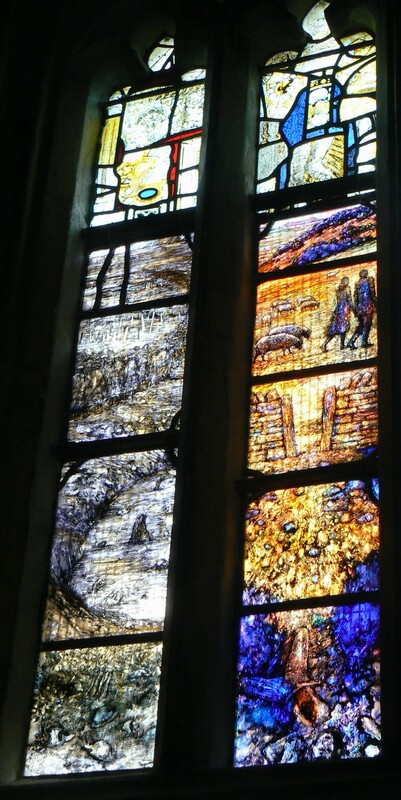 It really is a joy to find out the background to this beautiful window series in memory of Ivor Gurney. I was moved to tears by the beauty of the windows and by his poetry. How tragic war is for everyone involved, but especially for sensitive or troubled souls. Thank you so much for all of this information. Would it be fitting for me to add it to the body of my text and credit you? I am thrilled to learn more and I’m sure others would be too. Thank you Polly, I enjoyed writing it. Great post, beautiful poetry and the windows are stunning.. Thanks x the windows arI’m going to be a Tom Denny groupie and visit all his windows. Thanks for the lovely comment. I appreciate it. I am struggling for inspiration at the moment after a summer from hell! We’ve had so many crises that I am burnt out and seem to have lost my creative muse. It is very good to read other blogs at times like this ~ I always find yours fascinating ~ and to get positive feedback is a real boost. I’m really glad you liked it. 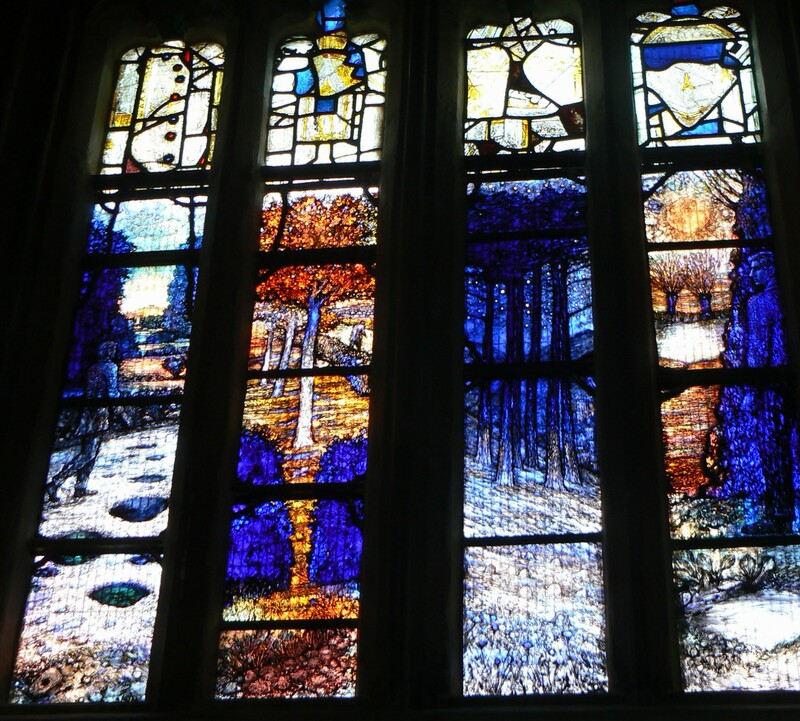 I adore stained glass windows, especially modern ones as they are just so colourful. I must search out his others and blog about them too. I have not been blogging much lately as we have had the summer from hell ~ household disasters and hubby’s accidents but we are starting to pick up a bit. I find now I have no inspiration at the moment and i am really struggling to find anything to write about! So I appreciate your comment, it has cheered me up no end!